What happens when athletes retire? Li Na, Zou Shiming, Christopher Pitts and Stéfanie Vallée have all represented their countries in the sport that they've mastered. For various reasons — injuries, changes of priotities in life, the pursuit of another dream and practical concerns about income — they've all now transitioned into other roles in their lives. In our four-part 'After the Finish Line' series, we look at their transformations — from a tennis legend to a mother and the ambassador for the sport, an Olympic gold medalist to a professional boxing champion and reality TV star, an observed trial cyclist to a chef, and a kayakist to an artist and executive coach. In the fourth part of this series, we chat with Shanghai-based Canadian Stéfanie Vallée on her transition from national kayaking champion to artist and executive coach. Water has been a part of Stéfanie Vallée’s life for many years. The 10-time Canadian Champion in whitewater kayaking was ranked fourth in the world before she retired from the sport in 2012. 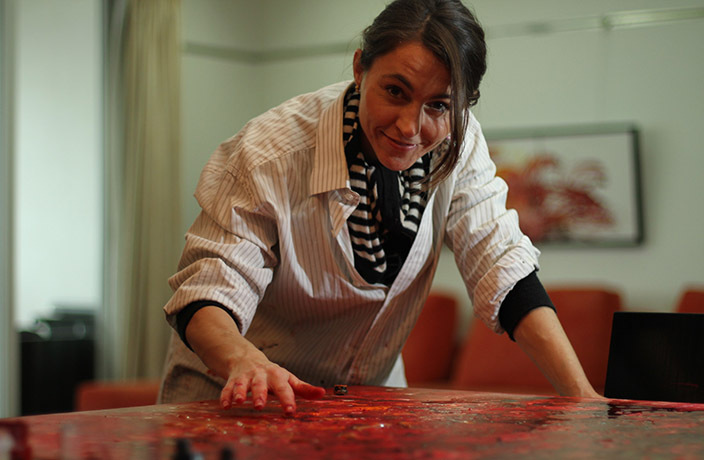 She’s also an award-winning artist specializing in the watercolor technique known as indirect painting, where Vallée creates each piece of work without a brush. Having never been a sporty person in her early years (“I would always find excuses to skip phys. ed. classes”), her first professional race at the Quebec Cup was a disaster. “I was so ashamed [of my performance], and there were so many spectators watching.” But this experience only made Vallée more determined to become the best kayakist in her country – hiring coaches who were willing to work with late bloomers (most professionals start training at age 10) with her own money. “I used to train twice a day in 60- or 90-minute sessions, either on water or at the gym. I did that six days a week, 11 months a year, for 15 years,” Vallée says of her rigorous routine. Stéfanie Vallée snatched 10 national Canadian championship titles and represented her home country in races around the world. All her hard work paid off in the end. In the next decade or so, she snatched 10 national Canadian championship titles and represented her home country in races around the world. She retired at the peak of her game in 2012 – when she placed fourth at the World Championship in France – and the decision was partially a personal one. Since 2008, Vallée had already been living in Shanghai. "Looking back, the most rewarding moments weren't about any medals, but the whole journey and all the occasions when I didn't give up." Vallée’s careers in sports and arts are also translated to her work as an executive coach. Her creativity became a great asset for developing programs targeting one’s problem solving and analytical thinking skills. Her talent for ‘listening to the water’ to anticipate its strength, direction and speed and make quick decisions in life threatening situations in the river was applied to listening to the needs and concerns of her clients, and helping top level managers realize their full potential and face leadership challenges. Thinking back to her humble beginnings, Vallée credits ‘L’eau Vive’ (‘Running Water’ in English) – an old French song that she used to sing when she was young – as having shaped her desire to become a kayakist. “The first verse goes like this: ‘Ma petite est comme l’eau, elle est comme l’eau vive… Courez, courez vite si vous le pouvez, Jamais, jamais vous ne la rattraperez (My girlfriend is like water, she’s like running water… Run, run, quick as you can, Never, never, you’ll never catch up to her),’” Vallée recites the lyrics, reflecting upon her fear of water as a kid. Read more articles in our 'After the Finish Line' series here. A look back at the history of the NBA in China, and how the American basketball league soared in popularity in the Middle Kingdom.